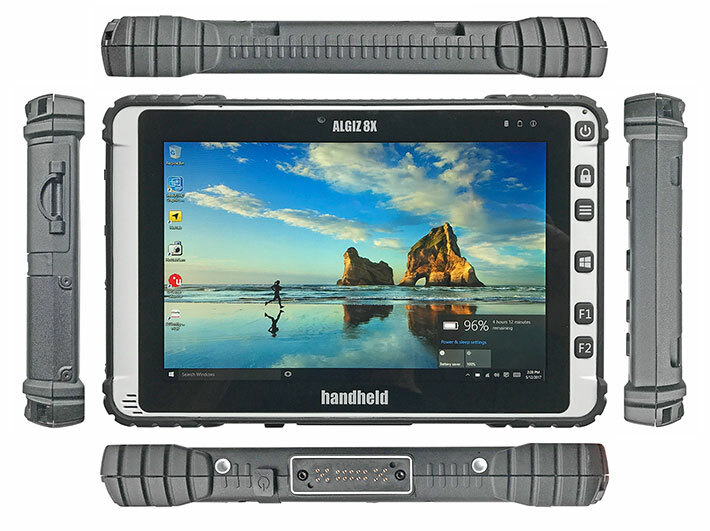 Handheld Group announced their new Algiz 8X tablet computer in February of this year. 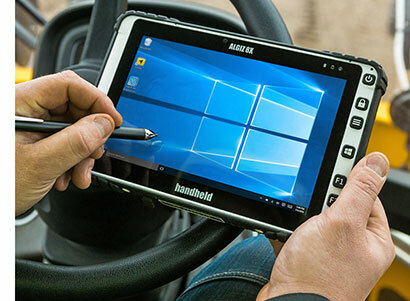 Now, the team at RuggedPCReview have given the tablet the ultimate test. 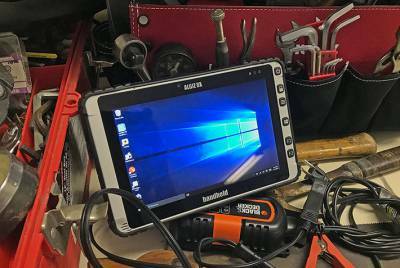 Swedish Handheld Group announced the Windows 10-based 8-inch Algiz 8X tablet computer in February 2017 as the latest in the company’s lineup of rugged mobile computers for field workers in all sorts of demanding environments. 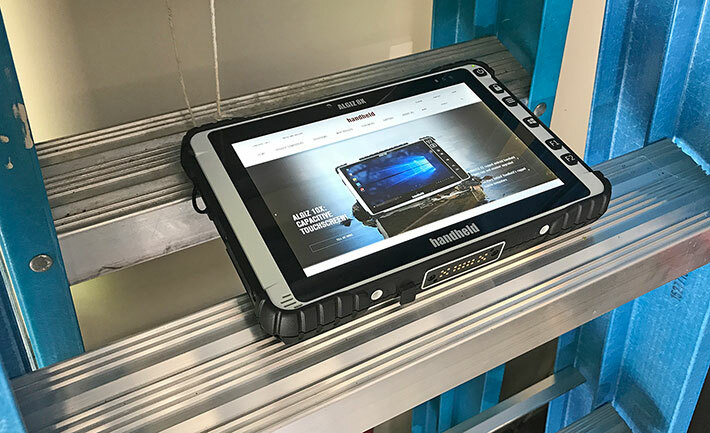 RuggedPCReview has now had a chance for extended hands-on with this handy, elegant tablet designed from the ground up for deployment in the field and under almost any environmental conditions. 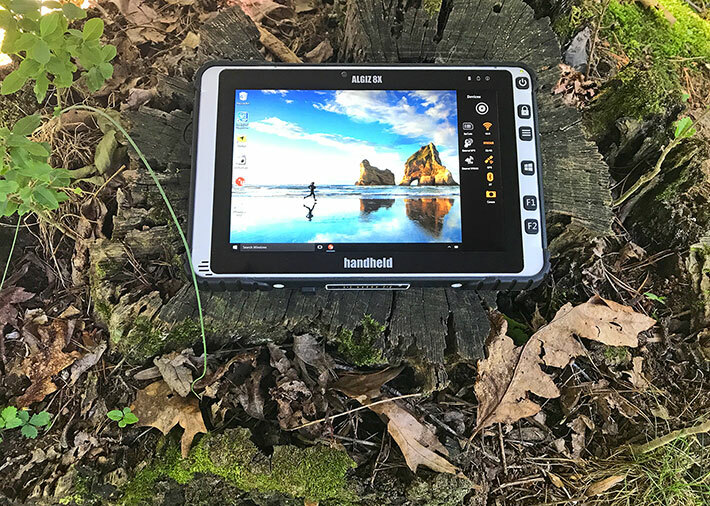 For a brief introduction to the Handheld Group, the company offers two primary product lines, those being the Nautiz branded rugged handhelds and the Algiz branded rugged tablets and (at times) notebooks. By now, most of the Nautiz handhelds are available with either Windows or Android. On the Algiz side, the Handheld Group also supports both Android (the Algiz RT7) and Windows, but the Windows-based roster dominates with three models to one. There’s the 10.1-inch 3rd generation Algiz 10X, the older 7-inch Algiz 7 (which is likely the next to undergo the “X” treatment), and the 8-inch Algiz 8X reviewed on this page. Note right upfront that the Algiz 8X was never meant to be sort of an iPad mini for the field. The Handheld Group believes that computers for the field must be designed for the job and built rugged from the ground up. With all the protection they might need, and all the functionality of a modern general-purpose Windows PC. The Algiz 8X measures 8.8 x 5.7 x 0.9 inches and weighs 2.2 pounds (just under 1kg). That’s larger and heavier than small consumer market tablets, but plenty compact and light enough for today’s mobile workforce that’s surveying, building, patrolling or distributing out there in the field where it can get cold and wet and things get dropped or banged around. The Algiz 8X display measures 8 inches diagonally and has 1,280 x 800 pixel resolution. That makes it about as sharp as a large 4K desktop monitor. The 16:10 aspect ratio looks pleasing to the eye — not too boxy and not too wide. With 600+ nits luminance, the Algiz 8X screen is much brighter than your average laptop. 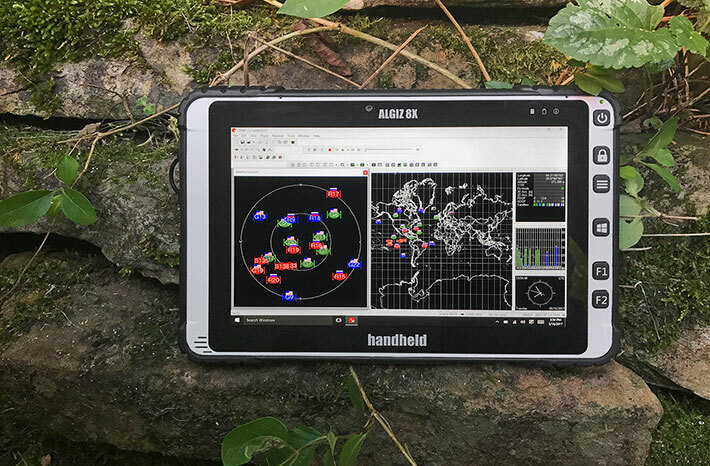 10-point capacitive multi-touch with glove and rain modes has pretty much replaced the old resistive touch even in rugged tablets, and the Algiz 8X has it. It works smoothly and responsively as users — spoiled by modern consumer smartphones and tablets — have come to expect. An optional active capacitive stylus is available. That still comes in handy when extra precision is needed (like mapping, legacy apps, etc., or when using ink-optimized software). For positioning, the Algiz 8X uses a u-blox NEO-M8N module with concurrent GPS and GLONASS support. That means the receiver can not only use the satellites of the US GPS, but also those of other positioning systems. Having more satellites for determining position improves positioning accuracy under adverse conditions or in areas with poor coverage. The Algiz 8X comes standard with the Enterprise LTSB version of Windows 10. LTSB stands for Long Term Servicing Branch. In essence, LTSB means instead of the operating system constantly being updated (and often at the most inconvenient times), the LTSB version receives less frequent but more comprehensive updates. Many small tablets for the field come with low-end Intel Atom processors that are adequate but no more. Handheld gave the Algiz 8X more than just adequate performance with a nice mid-range Pentium chip. In case an Algiz 8X is to be used for barcode scanning, Handheld offers an industrial-grade Honeywell scanner option. The Handheld Group has long excelled in their styling sense and expertise, and the new Algiz 8X is no exception. The flush glass surface of the capacitive screen extends past the LCD perimeter, giving the tablet a sleek, elegant, and contemporary look. Also note that the Algiz 8X has the latest version of Handheld’s MaxView display technology that uses a combination of optical treatments to make Handheld displays vibrant and readable under virtually all viewing conditions. A special bonding process “melts” LCD, anti-glare filter and touchscreen together, minimizing reflections and making the screen stronger. MaxView technology also increases contrast ratio, eliminates the “parallax” effect and condensation between layers, and provides extra durability and impact absorption. Below you can see what the Algiz 8X looks like from the front and from all four sides. The device, of course, is considerably thicker and heavier than consumer tablets, for a reason. It’s much, much tougher for one thing. But it also comes with a number of real ports instead of a Jony Ive-esque absence of them. Two full-size USB 3.0 ports. Micro HDMI. A flex port that can be populated with RJ45 LAN or a serial port. There’s a big, removable, hot-swappable 40 watt-hour battery. And optionally an extended one with 76 watt-hours. It’s the real deal as far as real-world productivity goes. The overall design is clean and modern, using the Handheld Group’s traditional design language and light-gray and black color scheme. The tablet is ergonomic, too. When holding the tablet with both hands, all hardware buttons are easily within reach of the thumb. The very sturdy corner bumpers and the rubberized cladding that goes around the entire tablet are part of the housing, attached during an injection molding process. I/O ports are on the left of the tablet, protected under a tight-fitting hinged rubber/plastic door with a little metal loop to pull the door open. That’s much easier than prying such doors open with fingernails. There are no labels or icons, but it’s not like you have to remember a dozen ports, just USB and micro-HDMI (plus whatever options that may be installed). The image below shows the left side of the Algiz 8X with its protective I/O door held open to show the two stand USB 3.0 ports and the small micro-HDMI port. On the left side is the screwed-on cover of the tablet’s expansion bay that can house either an RJ45 LAN jack, an RS232 serial port, or a 1D/2D barcode reader. As far as construction goes, the Handheld Algiz 8X housing consists of two polycarbonate plastic halves — the front light-gray, the back black — secured together via a number of Torx head screws of no fewer than three different sizes. So if you intend to disassemble an Algiz 8X, have a complete set in your toolbox. A tongue-and-groove rubber seal design keeps dust and moisture from penetrating. The tongue is hard plastic and part of the bottom half of the housing; the groove is part of the protective rubber moulding that goes around the perimeter of the top half of the tablet. The picture below shows the backside of the Algiz 8X with the expansion compartment access door and the battery removed. There are nine screw hole inserts on the back, presumably for vehicle/stationary mounting or accessories. The expansion bay compartment in our review unit contained a Sierra Wireless AirPrime EM7355 M.2 card (M.2 is a mSATA replacement that uses the PCIe mini card layout and connector) that provides LTE, DC-HSPA+, HSPA+, HSDPA, HSUPA, WCDMA, GSM, GPRS, EDGE, CDMA, and GNSS connectivity. Underneath the card is a SIM card slot. A second mini-PCIe slot is next to it, is used by the tablet’s Transcend labeled TS128GMTS400 128GB mass storage module (covered by a piece of heat-transfer material in the image). This is also a M.2 module, using a very fast SATA III 6Gb/s interface. The Algiz 8X 39.5 watt-hour (7.6V/5,200mAh) 4.75 x 3.5 x 0.55 inch rechargeable Li-Ion battery fits flush into a compartment in the back of the tablet. The battery is part of the design and there is no battery compartment cover. Sealing towards the interior of the tablet is via a rubber pressure seal around the battery power connectors. The battery has two strong snaps that very securely lock the battery into place. There is no chance that they will open by mistake. And the coverless approach means you can use the optional extended 76.6 watt-hour battery without needing a different battery cover. Once the T6, T8 and T10 Torx screws holding the two parts of the housing together have been removed, you can carefully separate the two parts of the housing. Carefully, because there are two ribbons between the two halves, one for the surface mount 19-pin expansion port in the back of the tablet, and the other for the rear camera. Once the halves are apart, you see a thick aluminum plate fastened to the front half of the housing, cradling and securing the LCD assembly. The roughly 5.5 x 4.75 inch motherboard is screwed onto the front part of the housing. The picture below shows what it looks like inside the tablet. Prominently visible inside the Algiz 8X is a small rechargeable 2.44 watt-hour battery that makes the tablet hot-swappable. It is held in place by a hefty aluminum brace that’s secured by two more Torx screws. Unlike in the larger Algiz 10X, the 8X’s DDR3L 1600 RAM module is easily accessible, sitting in a standard RAM slot. Located next to the hot-swap battery is another M.2 module, this one a fast second generation Intel Dual Band Wireless-AC 3165 802.11ac WiFi and dual mode integrated Bluetooth v4.2 module. The second-gen 3165 module, according to Intel, is “faster, stronger, and greener” than the initial Intel Dual Band Wireless-AC 3160, providing shared Wifi/Bluetooth antennas, lower power use in idle mode, and complete Windows 10 support. As far as cooling goes, like the larger Algiz 10X the Algiz 8X also does not have a fan. Instead, clever thermal engineering distributes the heat from the processor to the internal metal LCD frame of the device. That’s a remarkable accomplishment, given the significant performance of the unit’s Pentium N3710 quad-core processor. To provide onboard connectivity, Handheld used edge connectors on the motherboard for the tablet’s micro-HDMI port and dual USB 3.0 ports . These interface ports are sealed with a single rubber hinged and replaceable friction plug that has a little metal D-ring on it to pull it open. Additional I/O is available via an expansion adapter port located next to the standard I/O block on the left side of the tablet. The expansion adapter can be used for either an RJ45 LAN jack, a DB9 RS232 port, or a 1D/2D barcode reader. All of those are optional. The image below is a close-up of the I/O area of the Algiz 8X. The Algiz 8X includes an integrated 8-megapixel documentation camera with LED illuminator light. For positioning and navigation, the Algiz 8X has a u-blox NEO-M8N GNSS module that uses the company’s miniature 16.0 x 12.2 x 2.4 mm NEO form factor. The NEO-M8N (see product page) is a stand-alone GPS receiver that allows concurrent reception of up to three GNSS systems (GPS/Galileo together with BeiDou or GLONASS) which makes for excellent positioning accuracy in challenging geography or when only weak signals are available. In summary, just like the company had done with the larger Algiz 10X, Handheld packed an entire conventional (read highly expandable and configurable) Windows PC into the compact Algiz 8X tablet housing. That’s different from hyper-integrated consumer tablets that allow neither customization nor repair or re-configuration. Anytime you deal with full Microsoft Windows, you need some brawn in the engine compartment. That can be an issue because advanced heavy-lifting Intel circuitry doesn’t come cheap. And it usually meant a fan, lest one resorted to a lowly Atom chip. Fortunately, the performance gulf between Intel’s megabuck high-end chips and more affordable alternatives has closed considerably. Ever since the emergence of Intel’s “Bay Trail” chips and then the shrunken, improved next-gen “Braswell” version of the architecture, the problems of running full Windows on mobile hardware have been resolved. Bay Trail and Braswell processors use up to four cores and, unlike earlier Intel Atom microprocessor architectures, are paired with Intel’s own HD graphics. The graphics cores integrated into Bay Trail processors are of the same HD 4000 architecture and variety as those used in Intel’s powerful, high-end 3rd generation “Ivy Bridge” Core processors. Those in the follow-up Braswell chips are of the same Gen 8 graphics technology variety as in Intel’s 5th generation Broadwell Core processors. In the Algiz 8X, Handheld provides computing power and performance in the form of a quad-core Braswell Pentium N3710 chip capable of running at clock speeds over 2.5GHz with the turbos spooled up. What’s interesting here is that the Pentium N3710 in the Algiz 8X is very similar to the Celeron N2930 used in the Algiz 10X. The N3710, however, is a newer, more efficient design that, in theory, should provide better performance while using less power than the N2930. To provide an idea of the relative performance of the Handheld Algiz 8X, we benchmarked the numbers of the 3rd gen Handheld Algiz 10X , as well as the results of a couple of older Handheld Algiz products we’ve run through our benchmark lab tests, the Algiz XRW rugged netbook and the original Algiz 8 from 2009. For testing we used our two standard benchmark suites (Passmark Software’s PerformanceTest and CrystalMark). First, although the pace of improvement in Intel’s high-end Core processors has slowed over the last several generations, Atom architecture-based chip lines have made tremendous progress. The kind of bottomline performance the Algiz 8X delivers was the exclusive province of high-end mobile Core processors just a few short year ago. 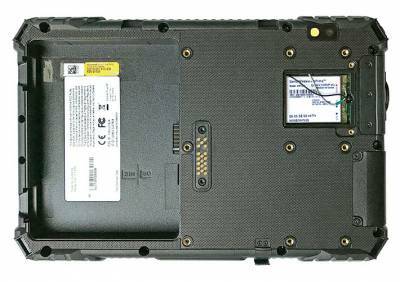 Second, even more drastic is the difference between the original Algiz 8 rugged tablet introduced in 2009 and the current Algiz 8X. The 2017 model weighs less than half and is more than 10 times faster! Huge progress indeed. Third, yes, the Algiz 8X is currently the fastest tablet Handheld offers and there aren’t many, if any, tablets in this class on the market that offer as much punch as the Algiz 8X. When sizing the battery, tablet designers must make some hard decisions. Tablets should be as light and handy as possible, yet a battery charge should still last long enough for users to concentrate on work rather than anxiously watch the battery meter go down. 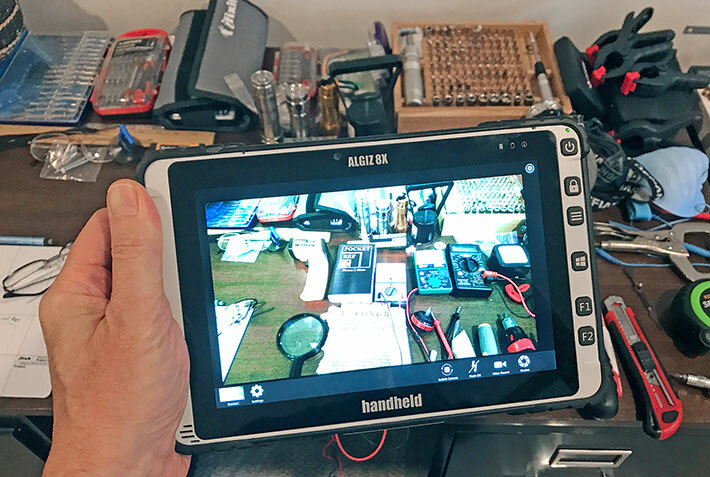 How did Handheld go about it with the Algiz 8X, and how well is the battery matched to the tablet’s considerable performance? As is our standard procedure, we used Passmark Software’s BatteryMon power management benchmark utility to measure the GammaTech laptop’s power draw under various operating conditions. First we set the Windows 10 power options to “Balanced” and display brightness to its lowest setting (0%). That way we saw an idle power draw of 5.7 watts. We then cranked the backlight up to 50%, and draw increased to 7.5 watts. Then we cranked brightness all the way up to 100% and saw 9.7 watts. Next we set the Windows 10 power options to “Power Saver” and display brightness at its lowest setting (0%). That way we saw an idle power draw of 5.4 watts. We then cranked the backlight up to 50% and draw increased to 7.5 watts. Then we cranked brightness all the way up to 100% and saw 9.6 watts. Finally, we set the tablet to “Max Performance.” At the lowest brightness we saw an idle power draw of 8.9 watts. At 50% brightness draw increased to 10.1 watts. And at the maximum standard brightness setting, electric draw reached 11.6 watts. What do those power draw figures mean in terms of projected battery life? The standard Li-Ion battery of the Algiz 8X has a capacity of 39.5 watt-hours. Dividing that by the lowest observed draw of 5.4 watt would indicate 7.3 hours of battery life with the system staying awake the whole time. That would be quite acceptable, especially since replacing the tablet’s hot-swappable battery with a freshly charged one takes just a few seconds. However, in the Max Performance setting and with the backlight cranked all the way up, theoretical battery life drops to just 3.4 hours. We don’t know if it’s the display or the Pentium chip’s power management, but the Algiz 8X is quite sensitive to settings changes. What this means is that customers should spend some time deciding which Windows Power setting is most suitable for their work, and they must also watch display brightness. Another option, of course, is to get the optional 76.4 watt-hour battery. It should pretty much double battery life under any scenario. The Algiz 8X is a pure tablet and does not have a physical keyboard or keypad. Instead, data is entered via touch or on-screen keyboard. There is, however, what Handheld calls the OSD Control Keypad (see above) along the right side of the display. It includes power, a touch mode button, a Menu button, a Windows key, and two programmable function keys. There are also four indicator lights for power, battery status, disk activity, and information. They are small and easy to see, without being too bright. The Touch Mode buttonlaunch the touch set selector (normal, rain mode, glove mode, and touch lock). The Menu button brings up a “charm” bar docked to the right side of the display (see picture below). Touch “Devices” to toggle a variety of functions on and off. Those are WiFi, WWAN, GPS, Bluetooth, camera and, if present, barcode reader and external WWAN and GPS. 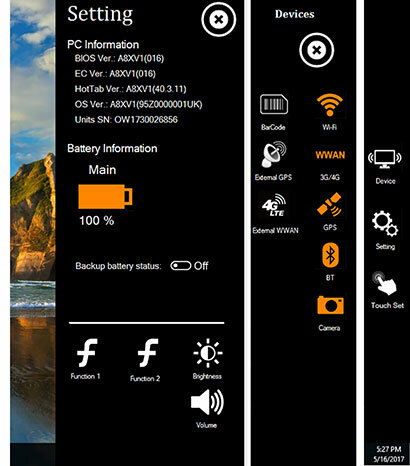 Touch “Setting”to bring up PC and battery status information, set brightness and volume, and program the two function buttons. The F1 and F2 function keys can each accommodate two functions, one via short press and one via long press. The menu shows half a dozen default selections (Internet Explorer, Media Player, Camera, Volume Mute, Calculator, and Notepad). The function keys, however, are not limited to those. They can also be assigned to other tasks or apps. That leaves one additional issue to be addressed: although Windows 10 is considerably more touch-optimized than Windows 7 and many users may spend most of their time in the Windows 10 “tablet mode,” there are still many occasions that bring up the good old desktop or legacy applications and OS utilities. And all those were designed for use with a mouse whose very precise operation works great with all those tiny check boxes, pulldowns and scroll bars. That’s a pesky Windows issue that’s not likely to go away anytime soon. Fortunately, a bit of user interface customization goes a long way towards making Windows easier to operate. Under Windows 7, users could optimize their display via the Personalization > Windows Color > Advanced Appearance Settings in the Windows Control Panel to re-size check boxes, scrollers, text, and various other Windows interface elements for best possible operation with a stylus or a finger. Sadly, that’s no longer the case in Windows 10, but the technically inclined can always launch the regedit utility, navigate to HKEY_CURRENT_USER > Control Panel > Desktop > WindowMetric and change the size of those tiny user interface elements there. Start with the ScrollHeight and ScrollWidth settings and go from there. That’ll make using legacy Windows controls with touch much easier. The Handheld Algiz 8X has two cameras. The one facing the user has a 2-megapixel imager and is used for Skyping or similar video calling and conferencing. The rear-facing camera has auto-focus, an 8mp imager, and an LED flash. It can do both still pictures and video. The rear camera can be used to visually document work status, progress, completion, etc. In many cases it’s easier to collect all data with one device rather than using multiple devices. Cameras integrated into vertical and industrial market tablet computers have historically underperformed compared to dedicated cameras and, more recently, the smartphone cameras. Integrated cameras improved substantially over the past few years, to the point where they were often good enough to eliminate the need of taking along a dedicated camera or smartphone if photo or video documentation was needed on the job. Over the past year or two we’ve been seeing a leveling off of integrated camera quality and ease of use, as if manufacturers had decided that smartphones have became so pervasive and their cameras so good as to render cameras integrated into rugged tablet irrelevant. Another problem with cameras integrated into Windows-based computers is that support of integrated cameras is minimal. That’s understandable due to the very large number of different camera hardware that might be used with the OS. As a result, the generic Windows camera app is severely limited, lacking anything beyond the most basic controls, and often taking in no way full advantage of integrated camera hardware. Which means that users will have to rely on available third party camera software. Our review Algiz 8X used the custom HotTabCam utility for the cameras instead of the standard Windows Camera app. The HotTabCam interface is very simple and easy to use, but also very limited in its settings. You can shoot pictures either in 4:3 or 16:9 format, and video in 640 x 480, 1280 x 720, and 1920 x 1080 format. Nothing else. Given the camera software limitations, it’s hard to assess the cameras full capabilities. As is, we think the camera hardware of the Algiz 8X can do a lot more than is accessible via the HotTabCam utility. The Algiz 8X tablet’s 8.0-inch display offers 1280 x 800 pixel resolution, making for 16:10 aspect ratio and a crisp 189 pixels per inch. That is the same sharpness you get from one of Dell’s excellent big 4k UltraSharp monitors. 189 ppi is not “retina” in the sense that you can no longer see individual pixels from the typical viewing distance. But the display looks very crisp and sharp. The 8-inch diagonal LCD size essentially splits the difference between one of today’s big smartphones and a standard iPad class tablet. The Algiz 8 display is small and handy, but definitely much easier to work on than any smartphone. What struck us is how much larger an 8-inch screen with a 16:10 aspect ratio feels than the once very popular 7-inch size with the wider 16:9 aspect ratio. Sometimes small difference in size and proportions make a big difference. Whereas in our recent review of the larger Algiz 10X it made sense to compare the original Algiz 10 with the new version because the new version was an evolution of the original, it makes much less sense to compare the original Algiz 8 with the new 8X model. Too much time is between them and they are totally different designs. I should, however, point out that the new 8X is considerably sharper, with more than twice as many pixels. That said, resolution alone isn’t everything, especially not with displays that are often, or predominantly, used outdoors and in broad daylight. It’s one thing for a display to shine indoors, and quite another doing so outdoors with its much higher brightness, the sun, and reflections everywhere. Over the past decade, the industry has done a remarkable job addressing those issues. Reducing the display’s internal reflection of ambient light via polarizers, filters, coatings and elimination of air spaces between the various layers of the LCD, in conjunction with a strong backlight, helped to make screens viewable outdoors. However, even with the best currently available technology, outdoor viewability remains a challenge, one where numerous factors must be carefully optimized and balanced against each other. Almost all modern displays have a glossy surface. That’s in part because gloss makes colors vibrant and pictures come to life, but that comes at the cost of external reflections. Gloss also is best for optimal implementation of capacitive multi-touch, where the surface must be as smooth and stiction-free as possible. What does all that mean for the display used in the Algiz 8X? To illustrate that we shot a number of test pictures in different lighting conditions. Starting with the two images on top, taken in lightly shaded areas, you can see that the 600-nits display of the Algiz 8X is plenty bright for outdoor use. The two pictures below them were taken in bright, direct sunlight. The picture looks considerably dimmer because the ambient light is stronger, but is still usable. However, as is the case with all glossy-surface tablets, it must be held just right or else there will be reflections. Viewing angle is a display quality that is just as important, and perhaps even more important, than brightness. Older LCD technologies required looking at the display head-on to get a true picture. Viewing from an angle would dim the image and/or change colors and contrast. The Algiz 8X display has no such issues. Display brightness, colors, and contrast do not change no matter what angle you view the display from, and there is also no annoying tint that often mars even good wide viewing angle screens. Very well done. 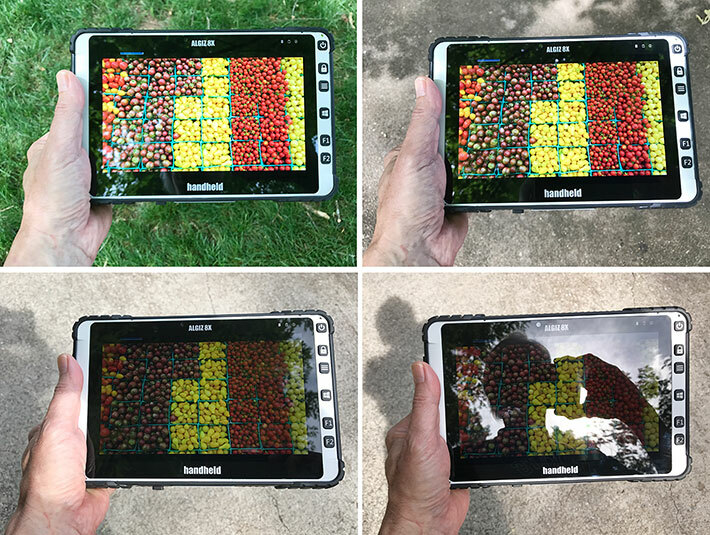 Overall, Handheld’s MaxView display treatment works very well, providing for enough contrast and brightness to use the tablet under almost all lighting conditions. We have seen display treatments with more muting of the reflections, but that usually comes with trade-offs. Like most glossy capacitive touch displays, the Algiz 8X is prone to fingerprints and other smudging. Overall, however, given the current state of display technology, this is an excellent screen. Until two or three years ago, almost all industrial/rugged tablets used resistive digitizers because capacitive touch was not ready for use on Windows-based devices designed for field deployment. Windows itself wasn’t touch-friendly, and capacitive touch couldn’t be used in the rain or while wearing gloves. However, the many advantages of capacitive multi-touch quickly became obvious, aided by the massive success of smartphones and consumer tablets. Capacitive touch did improve and the latest versions of Windows have become more touch-friendly, and so it was practically a given that Handheld would use capacitive multi-touch with the new Algiz 8X. The glove and wetness issues are handled via a touch mode settings utility that configure the Algiz 8X for normal use with finger and stylus (the default), rain mode, glove mode, or with touch locked. Glove mode works with fairly thick gloves on, but the stylus does not work in that mode. In rain mode, finger touch continues to work quite well, something that’s not the case with standard capacitive touch. Touch lock is for those situations where keyboard and mouse are attached. Our review unit didn’t come with the optional active battery-powered digitizer. We consider that still a desirable option because active digitizer’s “hovering” function is so well supported in Windows). Note that the Algiz 8X comes standard with a nice narrow-tip metal stylus that’s about five inches long. The narrow tip makes for much more precise stylus operation than those very broad-tipped early capacitive touch styli with their soft rubber tips. And those who love inking on their tablets will appreciate how smooth and easy ink goes on. No jaggies or jumps with this stylus. It can even be used for the input panel’s handwriting recognition option. 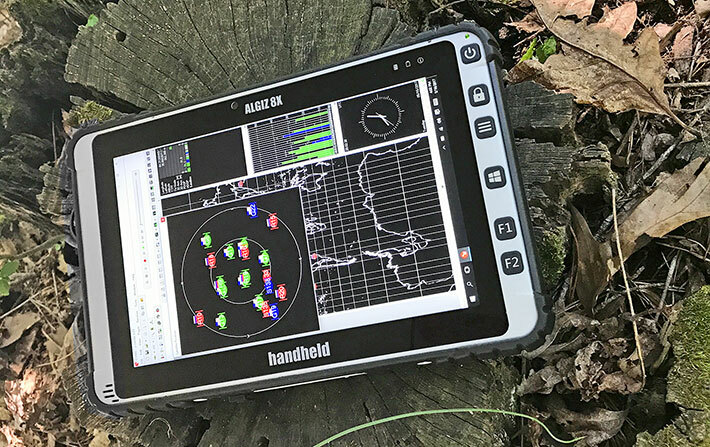 Like all mobile computing devices offered by the Handheld Group, the Algiz 8X is a rugged device specifically designed to hold up in the field, even under extreme conditions. According to its specs, the Algiz 8x can handle a very wide operating temperature range from -4 to 140 degrees Fahrenheit (-20 to 60 Celsius). It carries IP65 sealing where the “6” means the computer is totally protected from dust, and the “5” that it is protected against low pressure jets of water from all directions. The Algiz 8X also passed the MIL-STD-810G 516.6. Procedure IV test of 26 drops from a height of four feet to concrete. What does all this mean? As far as operating temperature goes, the device can be used in most environments where someone would be expected to work with a computer. The folks at the Handheld Group’s native Sweden know a thing or two about ice and snow and working in the cold, so we’re sure they have low temperature suitability covered, and not having rotating media onboard sure helps. Ample protection and cushioning (and not having a hard disk) make the unit immune to damage from drops from four feet, which is about the height it may fall while being used in a standing position. Here, the Algiz 8X’s modest weight and the protective corner bumpers provide excellent shock resistance. IP65 is decent sealing, but it’s not IP67 which is increasingly expected in rugged outdoor gear, thanks to a growing number of IP67-rated active lifestyle consumer smartphones. So why not IP67, which protects a device even against immersion into water to a depth of about three feet? Probably because it’s much more involved to seal a device with multiple standard-size ports and a quick-release battery to IP67 standard. So IP65 is okay, but we are a little concerned about potential leaks to the interior should the protective plug not be seated properly. Vibration resistance was tested as described in MIL-STD-810G, Method 514.6, Procedures I and II, for general vibration in a fixed mounting and a loose cargo test, but there is no detailed description. The Algiz 8X can handle operating altitudes up to 15,000 feet, and was tested according to MIL-STD-810G, Method 507.5 for humidity resistance. While some customers will probably want to see actual lab reports with more specific detail, the overall impression of the Algiz 8X is that it’s indeed a very rugged device that will likely be able to handle a good deal of abuse. 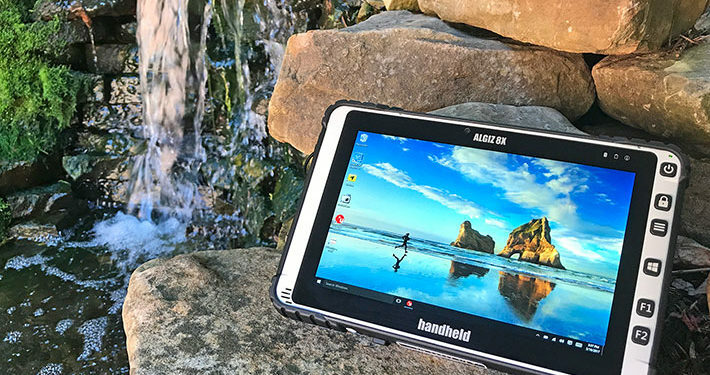 Arriving early 2017 just a few months after the greatly upgraded 10-inch Algiz 10X, the new Algiz 8X provides the Handheld Group with a powerful 1-2 punch to compete in the compact rugged Windows tablet market. Between its clean, functional, attractive look, effortless capacitive multi-touch, and a very good display, the Algiz 8X is clearly a state-of-the-art design that brings all the power and all the convenience of a consumer or business tablet into the field. With this new 8-inch tablet, the Handheld Group also carries on its tradition of offering interesting, versatile mobile computers covering every conceivable part of the company’s target markets. The quad-core Intel “Braswell” Pentium N3710 processor is a surprisingly strong performer, making the Algiz 8X the overall quickest device in Handheld’s lineup (and offering a good ten times the performance of the original Algiz 8 for those who remember that far back). The 8.0-inch daylight-viewable capacitive multi-touch screen display with its 1280 x 800 pixel resolution is bright, crisp, and sharp. It offers perfect viewing from all angles, without any color, hue or contrast shifts whatsoever. Like almost all glossy capacitive touch displays it’s prone to reflections, but overall this is a very pleasant display to use and work on. The Algiz 8X is rugged enough to be used in almost any environment, and its integrated bumpers protect against dents and scratches. It feels very solid and reliable, but do make sure the protective rubber plugs are always securely in place. Like most small tablets, the unit has limited onboard communication for wired connections (micro-HDMI and a couple of USB 3.0 ports) but can be expanded via optional serial and LAN modules. There is fast dual-band WiFi, WWAN, Bluetooth 4.2, concurrent dedicated GNSS, and optional integrated industrial-grade 1D/2D scanning. Like most specialized vertical market computing equipment, the cost is substantially higher than for consumer equivalents, but in terms of functionality on the job and total cost of ownership, the Algiz 8X is reasonably priced. How Many Calories Are You Really Consuming Mid-Flight? What Type Of Barcode Scanner Do I Need?